If you read this blog at all, you’ve already been introduced to my way of cooking…. Using “The Force”. This version of cooking was in full swing during the creation of tonight’s dinner. I started with chicken thighs, barely defrosted, so they were easy to slice. I opened a bottle of 2008 Saude Creek apple wine, made by James River Cellars, and created a sauce using hoisin, wine, garlic, ginger, lemongrass, and flour. After trimming a bag of broccoli flowerettes into bite-size pieces, I was ready to rock and roll. Browning the chicken took the most effort… but getting them nicely toasted was important and worth the extra time. I sautéed them in two batches and removed them from the pan once done. After that, it was a matter of throwing things into the hot pan just long enough to get things to gel. Broccoli went into the skillet next, but after a few minutes, everything else went into the pool. A fully blended sauce and cooked chicken mixed well with the broccoli, although I did add a little more wine when the sauce looked too thick. Cooking the 90-second brown rice and plating the meal were the final steps to this delicious and simple dinner. Try this with your favorite wine. You might find a new family favorite along the way! 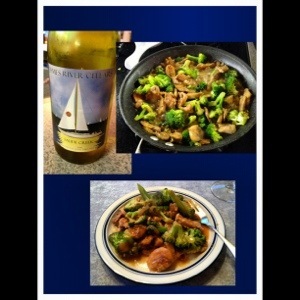 This entry was posted in Recipe, Wine and tagged broccoli, brown rice, chicken, hoisin sauce, Saude Creek Apple Wine.